My Dad Has HIV (1996) is an accessible text about HIV told from the point-of-view of a seven-year-old child whose father has the virus. The book, published by Fairview Press, was co-written by Earl Alexander, an HIV/AIDS instructor, and two elementary school teachers, Sheila Rudin and Pam Sejkora. It is colorfully illustrated by Ronnie Walter Shipman whose images reinforce the events and ideas discussed in the text. The narrator, Lindsey, is a second grader who describes being nervous about telling teachers and friends that her father has HIV. With the help of caring adults, including her father, Lindsey does tell her classmates. They are all very accepting once they learn the facts about HIV. 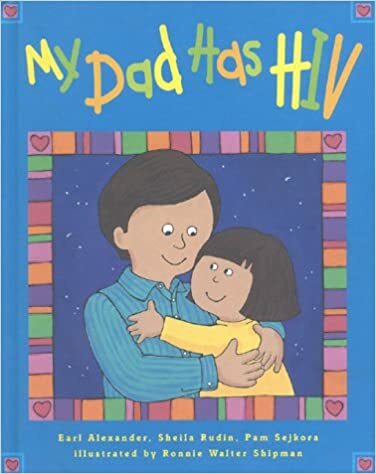 Along with helping children with HIV-positive family members find a representation of their experience, the book does a great job demystifying HIV for even the youngest readers. Interestingly, Lindsey’s father’s sexuality is not discussed. In fact, he appears to be a single parent. The tone is upbeat, the writing is accessible, and, although the book is now over twenty years old, it does not appear dated and would make a strong addition to personal and classroom libraries. My Dad Has HIV remains available and affordable if purchased used.